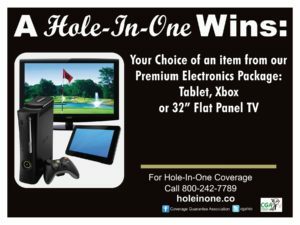 Showcase your sponsors, giveaways and more by ordering your hole-in-one signs for your next event from CGA. CGA 18½” X 24½” professional four-color promotion signage including stakes are an easy way to advertise your sponsors and offer terrific prizes. Hole-in-one giveaway signage is easy to customize and display. Tournament players can win huge prizes for their perfect shot such as cash, cars, trips, tablets, games, TVs and much more. CGA can print color or black and white logos on your signs to advertise your company name, sponsors and more. Simply mail a jpeg file or camera-ready artwork at least 10 business days prior to your tournament and CGA will include your individualized logos. All other orders can be bound and signs mailed within as little as 48 hours, so you can add in special prizes even at the last minute. Order signs for all 18 holes with our sponsor signs and showcase a special sponsor or offer with every swing. Contact CGA to learn more about hole in one signs and order yours. 5-day/4-night cruise for two to the Caribbean. Premium Electronics Package: your choice of tablet, Xbox, or 32″ flat panel TV. Two roundtrip airline tickets anywhere in the continental U.S.
Signs are shipped free via UPS Ground. FedEx may be used on short notice for an additional fee. Would you like signs for all 18 holes? Get a quote for sponsor signs!